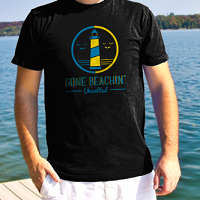 Home/Apparel, Support Local/Gone Beachin’ Apparel Co. Premium quality apparel for the ocean and fresh water lifestyles. These lifestyles are represented through our Gone Beachin’ Salted and Gone Beachin’ Unsalted apparel lines. Our apparel and merchandise gives you the opportunity to hit the beach in style and take the memory of your beachin’ experiences with you wherever you go. Designed and printed in Michigan.